Parade belts for marching bands and Military organizations. Made from different fabrics such as Courlene, PVC and leather. Come is different sizes with different buckle types. Parade belts in white courlene for Cadets , military and marching band. Courlene is a stiff nylon material that the military use for belts. Can be cut to any length. This is a great belt and used by Cadets and Military units. Very smart looking belt. 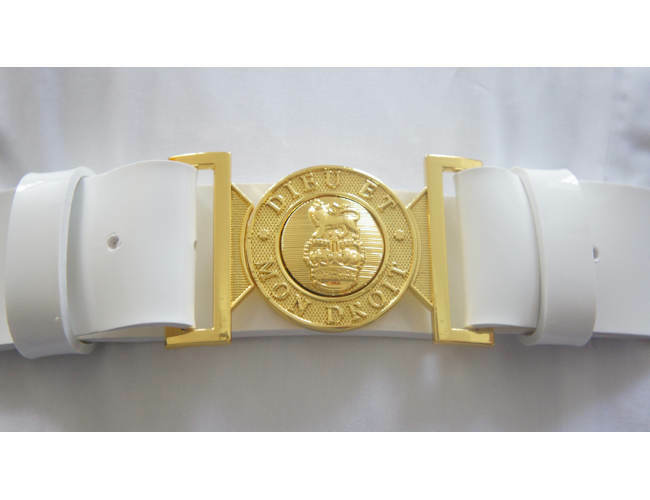 This is a regulation parade belt in white courlene webbing. It comes with two loops and has a mod plate either in Brass or Chrome effect. These belts are used in parades or march past and worn with full dress uniform. It is important to look smart while on a march past as this is a celebration and a time to stand out.\The belt can be cut to length. These PVC parade belts come in a white or black PVC material which makes a good parade belt. 57MM and 45MM widths with various types of buckles. Chrome and brass plate or hook style. These can be in white or black with variations of the buckles chrome or brass. This buckle is usually worn with a PVC belt. Comes in either white or black belt. Buckle is in a chrome or gold in colour. 2 loops and side adjuster buckles.